We do. We love fish – and were lucky to find one of the best fish restaurants in Antalya right outside our door. 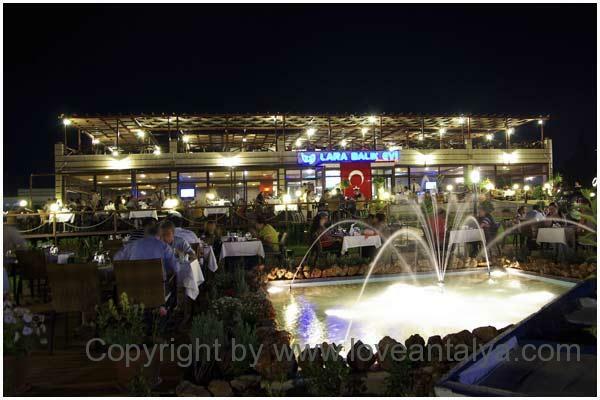 Actually Lare Balik Evi have two restaurants – one in the Lara district and one in the Konyaalti district. But they a both equally amazing. 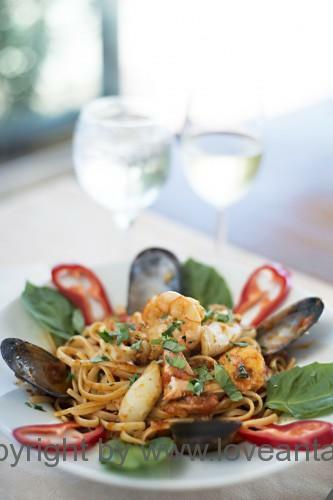 They have all you can imagine, Lobster, giant prawns, sea bass, bonito, tuna, anchovies, bonito and many, many more combined with delicious salads, mezes (small dishes with local specialties), good wines, desserts etc. We have enjoyed many happy meals there – with our without friends and family. And it’s a firm deal, that we always eat there at least once or twice during a holiday. Even the kids are looking forward to eat there (one of them wont eat fish unless it’s from this restaurant !). It’s a perfect place to enjoy lunch, but we prefere dinner in the evening because of the atmosphere and the stunning view over Antalya bay. It’s so amazing with all the lights and the smell of sea water while you eat your perfectly prepared fish. There’s also a kind of kindergarden for minor kids and kind staff to look after them, if they cannot sit as long as their parents. Also you can chose your own fish from the ice-covered counter and chose if you would sit inside the restaurant, at one of their many terraces or in the garden. We always sit at the roof terrace to have the best view. If you have a larger party to celebrate something, it’s possible here – they can host up to 300 guests. Read this article in Danish / find denne artikel på dansk her.